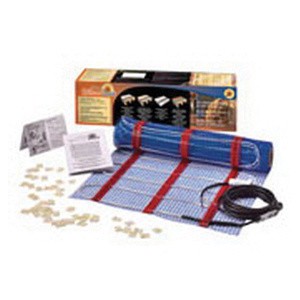 Emerson EasyHeat® Warm Tiles® Floor warming self-adhesive mat kit measuring 15-ft, has a voltage rating of 120-Volts AC and current rating of 1.3-Amps. It can be rolled and used for large areas effectively. This mat provides heat up to 12 to 15 Sq-m areas. The mat has plastic mesh substrate that provides additional layout customization. It is suitable for commercial and residential applications, warming of stone, marble, ceramic and engineered wood floors. The mat kit meets UL, CSA and CE standards.